What’ll It Be for the New York Diner? BLT (light on mayo), 2 eggs over easy, or extinction? Watching and lamenting the massive diner die-off. There’s a story that a few of the wistful regulars from my old diner, Joe Jr.’s, which used to occupy a narrow little space in the Village on the southeast corner of Sixth Avenue and 12th Street, still like to tell about the time Louie the waiter died of a heart attack. Like many vanished coffee shops, diners, and luncheonettes around the city, Joe’s was a loose, convivial club for the people who frequented the place. I would see the movie director John Waters at the counter, dressed in his neatly pressed suits, sipping coffee in a fastidious, mannered way. Isaac Mizrahi was a regular during his pre-TV days, and if my addled memory is correct, so was that great chronicler of big-city eccentrics, the New Yorker writer Joseph Mitchell, who used to drop by now and then, wearing his gray fedora. Louie was the indispensable front-of-the-house man at Joe Jr.’s, a formidable maître d’ figure who, like Sirio Maccioni during the heyday of Le Cirque, knew the quirks of all the regulars and assigned everyone to his or her proper place. He knew that I preferred to sit at either end of the counter for my solitary afternoon BLTs (with extra mayo) and that my youngest daughter, Penelope, liked her usual chicken soup (in a bowl, extra crackers) any time of the day or night. He kept order when drunks would stagger in off the street, and he had a knack for calming down the more unconventional Village regulars, like “the Tattoo Lady,” whose face was covered in a pattern of intricate tattoos, and another regular who had a habit, when she was overwhelmed by the cares of the world, of screaming out her normal order — “Eight coffees, light and sweet!” — at the top of her lungs. Joe Jr.’s closed in the summer of 2009, with a farewell note hastily tacked up in the window explaining that the restaurant had lost its lease and, after more than 30 years in business, they were saying good-bye. Like Henri Soulé’s famous French restaurant, it was replaced, in time, by a more fashionable version of itself: a café serving Brazilian coffee, where a new generation of headphone-wearing habitués crowd the uncomfortable wood chairs, peering silently into their laptops, sipping four-dollar coffee from biodegradable paper cups. For a while, the Platts tried to find another place in our little neighborhood to go for our family breakfasts, but the dwindling number of old-time diners and coffee shops were too crowded or too anonymous or too far away. When my daughters want a bowl of chicken soup, these days, they get it at the Pret a Manger down the street, and although I pass the now-svelte Mizrahi on the street sometimes, I’ve never seen John Waters or the Tattoo Lady again. Like most mass-extinction events, the Massive Diner, Coffee Shop, and Greasy Spoon Die-Off has been unfolding slowly around us for decades, in plain sight. 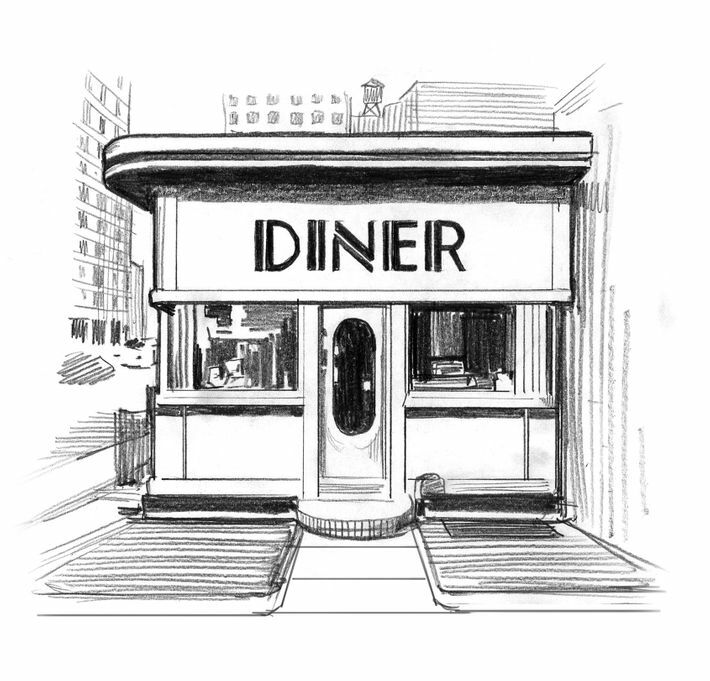 According to a much-fretted-over Crain’s report from a couple of years back, the city’s Department of Health lists around 400 restaurants with the words diner and coffee in their name, a number that experts say is down from a thousand restaurants a generation ago. (Many nouveau coffee shops don’t have coffee in the name.) 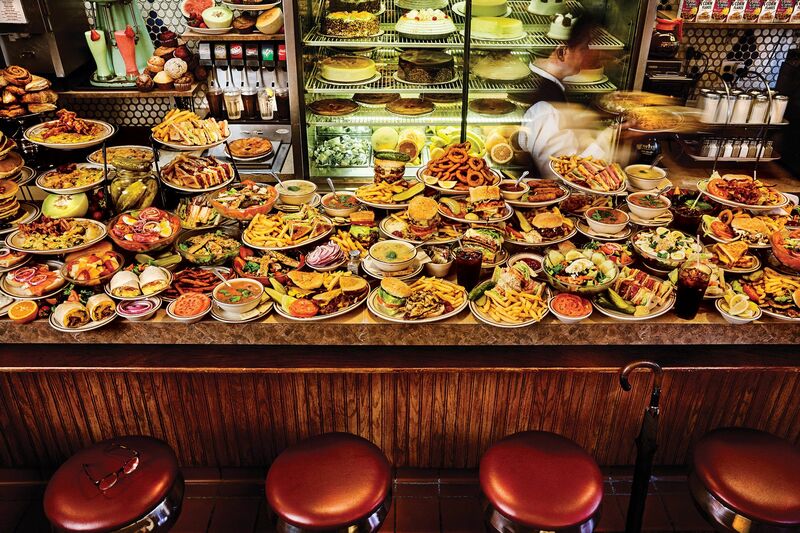 Like the old Automats and cafeterias of the ’50s and ’60s, and a generation of classic Jewish delis before that, diners are in decline for many reasons: skyrocketing rents and land values; ever-rising food prices; the spread of a more expedient, highbrow and lowbrow coffee culture; the gentle, inexorable aging of a whole generation of neighborhood “regulars”; the difficulty of keeping an ancient, sprawling, ten-page menu in tune with the changing tastes of the times; and the challenges of passing on a family business to a new generation of proprietors, many of whom have the benefit of a college education, and might prefer frittering their days away in barista bars to breaking eggs over a hot stove. “I still go to the old diners for nostalgia, but I’m not mourning terribly. 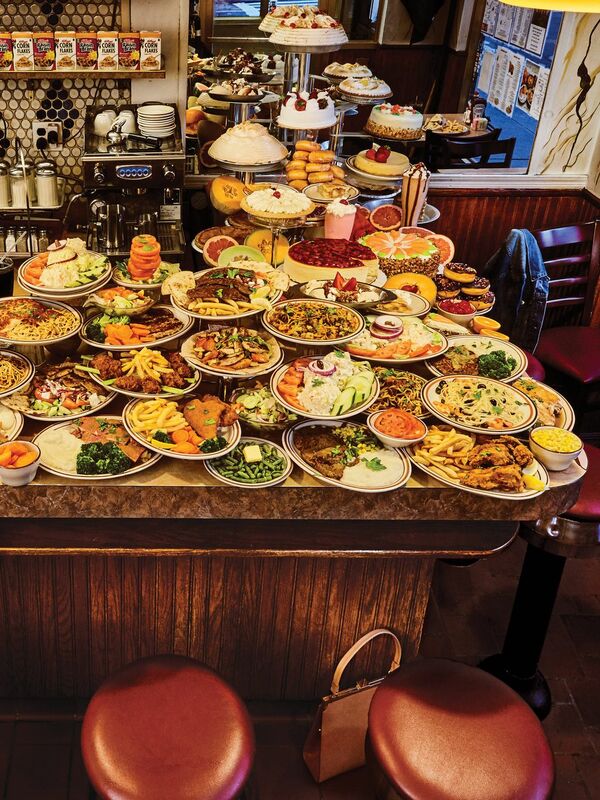 I’ve seen too many places go,” says the noted eater and New York City restaurant historian Arthur Schwartz, who resides in Brooklyn and charts these anthropological gastronomic trends as they move mercilessly across the city’s dining savannah. Like many scholars of the genre, Schwartz makes the fine — and now moot — distinction between old-school coffee shops and “the freestanding diner experience.” When he was growing up, that was the old Market Diner on Eleventh Avenue, by the entrance to the Lincoln Tunnel — as far as he knows, the Market was the last actual diner operation in Manhattan to have its own parking lot. It was a ’60s diner, famous for its futuristic, Sputnik-like design, and since the Market shuttered in 2015 to make way for a 13-story luxury building, Schwartz says he can now count the number of old dinosaur drive-in diners left in the outer-boroughs on two hands. Schwartz dates the freestanding-diner craze back to the 1870s, when a pioneer named Walter Scott began selling meals on the streets of Providence from the back of a latter-day horse-drawn food truck. The heyday was after World War II, when gleaming prefab structures shaped like railway cars were shipped to every corner of the new interstate-highway system. But in New York City, the pioneers were Greek street peddlers, who sold candies from pushcarts downtown before moving into candy shops around the 1920s, and from there into the more permanent world of diners and short-order coffee shops. Some of the old Greek families have moved on to a slightly more elevated brand of restaurant (the Livanos family runs a diner in White Plains along with the upscale midtown establishments Molyvos and Oceana), and many others have abandoned the business. Some diners have flourished around town by cannily adapting to their local terroir — Veselka in the East Village, which is famous for its Ukrainian soups and pierogies, as well as its function as a 24-hour refueling stop for neighborhood party hounds, and the Lindenwood Diner in heavily Caribbean East New York, which serves morning eggs piled with fried yuca or sweet plantains, and a roster of cocktails spiked with Hennessy — while others have adapted less well and perished, the way all restaurants do in the long run. Meanwhile, nimble survivors of the diner apocalypse, particularly in Manhattan, are flinching at the slightest sign of trouble and watching their backs. “We’re trying to carry on the tradition, but there’s not much left of it anymore,” says Josh Konecky, the genial, mountainous gentleman who currently runs Eisenberg’s Sandwich Shop, which was has been peddling assorted comfort dishes on the northwest side of lower Fifth Avenue, between 22nd and 23rd Streets, since 1929. Konecky negotiated a favorable lease with one of the building’s two landlords, an old fresser who, as part of their agreement, paid $2 for any item on the menu every time he came in. But that landlord died around five years ago, and the other one, who has no taste for egg sandwiches and lives out in Connecticut, has been noncommittal. Konecky isn’t exactly looking to sell, but he’d pay attention to the right offer. Cristo Kaloudis, the proprietor of Neil’s Coffee Shop, which has occupied the same spot on the corner of Lexington Avenue and 70th Street for over 70 years, hopes to avoid similar problems by handing off the operation to his son. “Times are changing, and I’m an old-fashioned man,” says Kaloudis, who arrived in the city during the ’60s from the island of Chios and worked in kitchens out in Forest Hills before taking over Neil’s 37 years ago. The L-shaped dining counter in the little corner space looks like it dates from the original Neil’s time, as do the gently fading vinyl booths, which are filled, most mornings, with a mix of students from Hunter College down the street, doormen and maintenance guys on their breaks, and assorted retired diplomats and Wall Street fat cats from the white-shoe neighborhood. 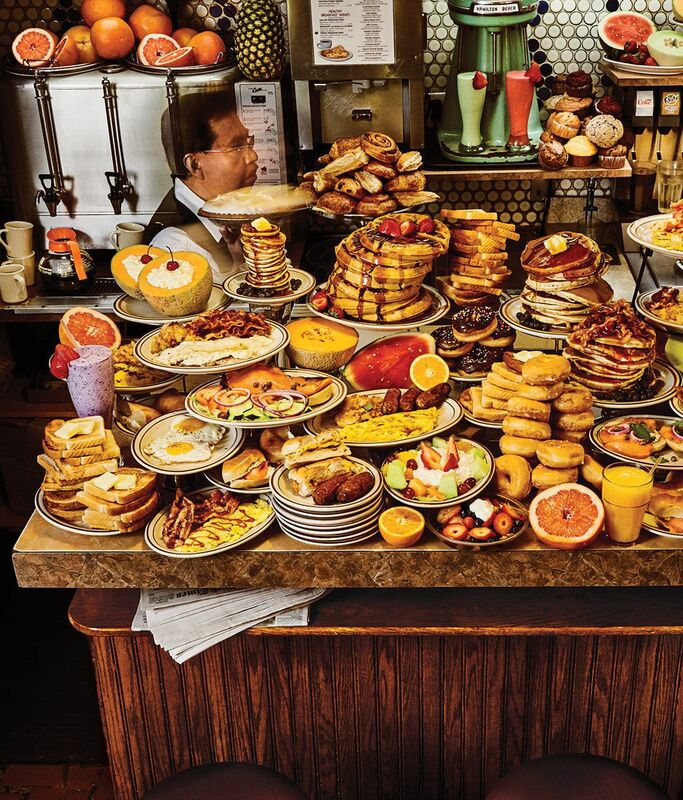 My father, who regards Neil’s as his own unofficial dining club, calls them “the local geezerati.” He often takes his grandchildren on weekend mornings to experience the ancient, choreographed ritual of the breakfast rush, the way other elders in the neighborhood drag their offspring to the city’s museums. Kaloudis, who will turn 80 this year, says he could have bought the building years ago (“The price was a million bucks in ’82. Who’s got a million bucks?”), and it will be up to his college-educated son, Nick, to renegotiate the lease when it comes up in a few years. In accordance with diner custom, he’s added to the menu steadily over the years to accommodate changes in dining fashion (“We have avocado smoothies now,” he says with a shrug), but admits that stocking ingredients for so many dishes — the endless variety of options being one of the psychological delights of diner dining — isn’t getting any easier in this era of disappearing profit margins. His best-selling low-margin item is the egg, which comes in 29 preparations on the menu. Every day, Neil’s goes through 30 pounds of ground beef, most of which is used to construct the 22 different hamburger combinations, along with meat loaf and the freshly made Bolognese sauce. “Nothing here is frozen except the French fries, the beef gyro, and the ice cream,” says Kaloudis. If you want to see the plight (and also the genius) of an operation like his, look no further than the lowly turkey breast. At Neil’s, they bake a 20-pound breast every morning, which goes into turkey-club sandwiches, turkey burgers, turkey avocado wraps ($12.95 under the “New Additions” section), Turkey Diet Delights ($14.50 under the “Diet Delights” section), and the classic turkey dinner ($16.95 with mashed potatoes and gravy). But with the price of turkey steadily rising (from $3.40 per pound two years ago to $4.25), it’s increasingly difficult to turn a profit (“We have low prices here. I never raise them!”). Ironically, in elevated restaurant circles, among the taste-making cooks who cater to the arugula generation, the rituals of the diner have never been more popular. “I love the lingo, I love the food, I love the waitress calling you ‘Hon’ when you come in the door,” says Wylie Dufresne, who made his reputation as a pioneer of what used to be called molecular gastronomy, and is now applying that approach to the elaborately flavored doughnuts at his recently opened Williamsburg coffee counter. He thinks short-order cooking and barbecue are America’s greatest contributions to the international culinary canon, and he can recite the names of the great silver-clad structures — Haven Brothers and the Ever Ready Diner in Providence — that used to dot the highways of his early youth, the way nautical buffs can tick off the names of grand, disappeared ocean liners of the early-20th century. “It makes me terrified when I see these places closing, because when they go, they’re not coming back,” the chef is saying as we sit at the counter of Joe Jr. Restaurant on Third Avenue in Gramercy Park on a recent Tuesday morning, waiting for our breakfast. This Joe’s (according to legend, the two Joes had the same owner until the mid-’70s) has become famous, in recent years, for the quality of its $6 cheeseburger, but Dufresne has been a regular since he was a student at Friends Seminary High School down the street. He dines here at least once a month with his family, and he likes to bring superstar-chef friends from out of town, like Noma’s René Redzepi, to sample his favorite meal — a cheese omelet with sausage, hash browns, and fresh-squeezed orange juice — and watch the timeless ballet of the line cooks as they break eggs over the griddle and flip the shells into the garbage can behind their backs. It’s a nostalgia not just for a certain kind of food but for a slightly less fussy New York City. When our breakfast arrives, it’s easy to see why. The omelet isn’t the blotchy, half-burnt frittata you get at some greasy spoons. It’s a perfect pale-yellow color, and the egg is twirled around the cheese in smooth layers, which, Dufresne points out, is not easy to do when you’re making your omelet on a flat griddle. The orange juice has a vivid, even tropical freshness to it, and there are bits of seedless pulp floating pleasurably in the bottom of the glass. As we enjoy our breakfast, Dufresne reminisces about his favorite diner dishes over the years: the late-night soups at Veselka, eggs and sausages at the Stage Restaurant down on Second Avenue. It’s a nostalgia not just for a certain kind of food but for a slightly less fussy New York City, when Manhattan was a little more of a working-class borough and the town really did run 24 hours a day. Additional reporting by Amelia Schonbek. Prop Styling by Dorothee Baussan at Mary Howard Studio; Food styling by Jamie Kimm; Bag by Mansur Gavriel. *This article appears in the June 26, 2017, issue of New York Magazine.